Whether hunting or fishing, the stealthy Realtree® APG™ HD® camouflage coating on the Trans4x4 means this Mule™ will blend into its environment. New for 2012, Blaze Orange model badging adds to the Realtree styling. Built with the same great features as a Trans4x4, this vehicle will get you where you need to go in an off-road environment, with plenty of power to spare. Its selectable four-wheel drive, electric power steering (EPS) system and powerful, digital fuel injection (DFI®) equipped engine work in conjunction with a fully automatic transmission and locking rear differential to make the handy Mule 4010 Trans4x4 an outstanding choice for just about any utility vehicle need. Bold styling and the outdoor motif graphic package are complemented by user-friendly controls and dashboard layout, and a tilting cargo bed allows simple unloading. Hunting and fishing are often group activities. 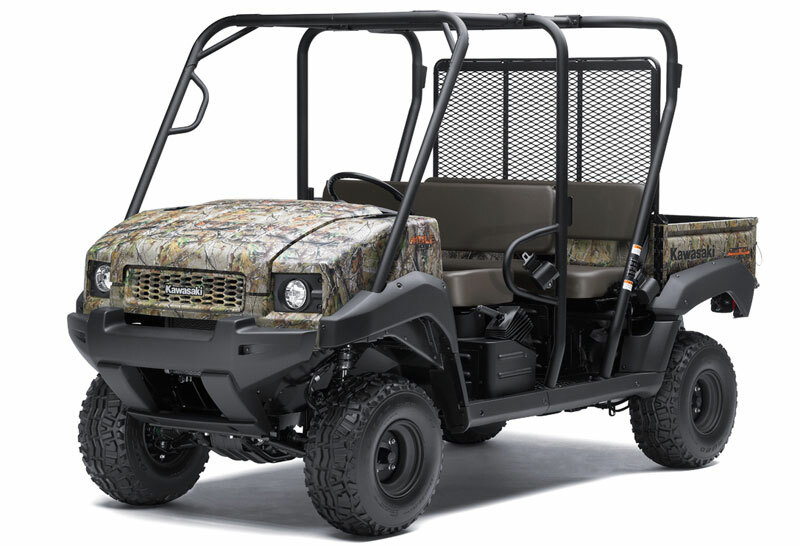 And when you have several buddies who want in on the hunting party, you can feel confident the Mule™ 4010 Trans4x4® Realtree® APG™ HD® can successfully transport up to four adults –and their gear– deep into the back country. Built with an ingenious design that allows this utility vehicle to transform from a two-person tool and gear hauler into a four-person transport, the Mule 4010 4×4 offers the flexibility to invite more friends along for wilderness excursions. Whether hunting or fishing, the stealthy Realtree APG HD camouflage coating on the Trans4x4 means this Mule will blend into its environment. New for 2012, Blaze Orange model badging adds additional Realtree styling. Built with the same great features as a Trans4x4, this vehicle will get you where you need to go in an off-road environment, with plenty of power to spare. Its selectable four-wheel drive, electric power steering (EPS) system and powerful, digital fuel injection (DFI®) equipped engine work in conjunction with a fully automatic transmission and locking rear differential to make the handy Mule 4010 Trans4x4 an outstanding choice for just about any utility vehicle need. Bold styling and the outdoor-motif graphic package are complemented by user-friendly controls and dashboard layout, and a tilting cargo bed allows simple unloading. The Mule 4010 4×4’s liquid-cooled 617cc four-stroke V-twin is managed by a digital Electronic Control Unit (ECU) and features a DFI system that compensates for variations in atmospheric pressure, engine and air temperature. The result is smooth and consistent engine starting, crisp throttle response and more precise fuel metering, which helps reduce fuel consumption and reduce emissions. The ECU incorporates an automatic fast idle speed control that activates when the engine is cold, eliminating the need for a manual choke. Its electronics also regulate maximum engine speed, eliminating the need for a mechanical governor. The powerful 617cc V-twin engine is mated to a continuously variable transmission (CVT) that features both high and low range plus reverse. Power is transmitted through a dependable, low-maintenance shaft drive system to a dual-mode rear differential that can be locked to maximize traction, or unlocked to improve handling and minimize ground disturbance when making tight turns. Mule 4010 Trans4x4 drivers can also engage four-wheel drive for extra traction in difficult conditions. The wheelbase of the Mule 4010 Trans4x4 may be 11.6 inches longer than a standard 4010, but still offers a tight turning radius and excellent rough terrain capabilities. An electric power steering (EPS) system makes the low-effort rack-and-pinion steering even easier to turn. The EPS reduces steering effort by up to 30 percent, and is a significant boost at low speeds in four-wheel drive, using input from vehicle speed and torque sensors to determine how much assistance is required from the system’s electric motor. With the forward/reverse, high/low-range gear lever and the four-wheel drive selector all within easy reach on the dash, drivers can focus more attention on negotiating rough or fragile terrain. The Trans4x4 dashboard features an easy-to-see coolant temperature warning light, hour meter, a horn, dual glove boxes, driver and passenger cup holders and a push-button control that activates the headlights. The cab also features retractable rear seat belts and padded rear-passenger grab handles. 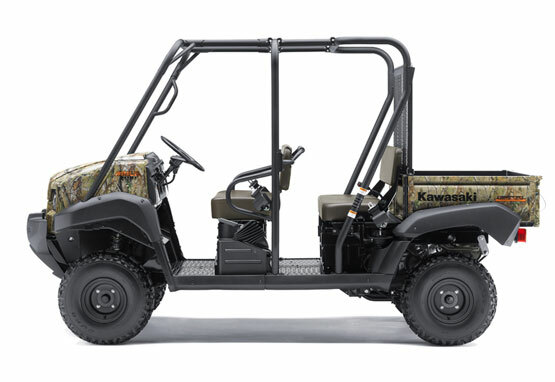 With its modern and rugged bodywork, this four-wheel drive utility vehicle is a natural in tough work environments. Its body panels are manufactured from a durable, color-molded plastic that helps hide minor scuffs and scratches. The extendable cab on the Mule 4010 Trans4x4 is surrounded by the large-diameter steel tube frame structure. The front hood can be opened with the pull of a dash-mounted knob and allows access to a deep storage space equipped with convenient D-rings to help secure cargo. Additionally, two levers make opening and closing the tailgate a secure and easy process. The convenience factor on the Trans4x4 extends beyond easy-access latches or controls; it also boasts owner-friendly features like the winch-ready tabs located under the front grille, which greatly simplify the winch-mounting process. Maintenance chores are simplified with an air restrictor gauge in the cab to indicate when the air filter needs to be cleaned or replaced, and the fuse box and oil dipstick are conveniently located underneath the seat for quick access. Effective stopping power is provided by four hydraulically operated, self-adjusting, sealed drum brakes designed to resist contamination from water, mud and other debris. Large 23-inch low-pressure tires provide a comfortable ride, great traction and help minimize impact over a variety of terrain. A smooth-riding MacPherson strut front suspension works in conjunction with a heavy duty DeDion-type leaf spring rear suspension system to provide the Trans4x4 with an extended-bed 800-pound cargo capacity, or a 400-pound capacity when in four-passenger mode. 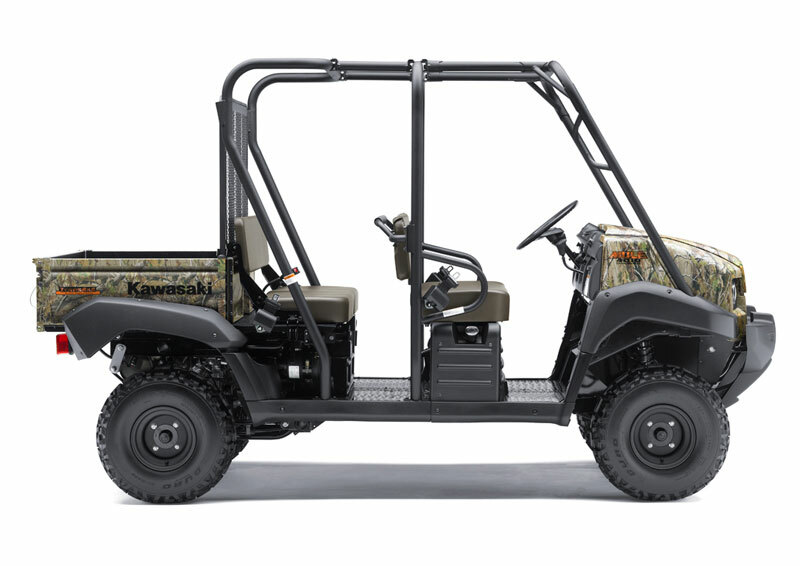 In addition to its stellar payload capacity, the Mule 4010 Trans4x4 utility vehicle can tow up to 1,200 pounds with an optional draw bar. Other popular accessories include an enclosed cab, cab heater, snow plow and soft or hard tops. These and many other Authentic Kawasaki Accessories are available through Kawasaki dealers.